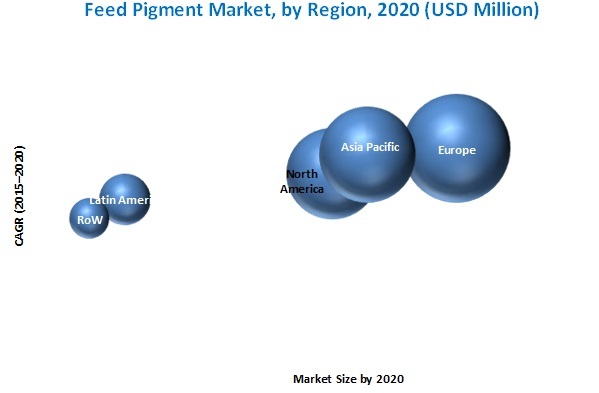 [180 Pages Report] The overall feed pigment market is expected to grow from USD 917.4 million in 2015 to USD 1,071.4 million by 2020, at a CAGR of 3.2% from 2015 to 2020. Feed pigments are essential feed additives and play an important role in improving the characteristics of the feed. Apart from its primary function of giving the feed a distinct color, it also benefits the animal by strengthening the immune and reproduction systems and enhancing the metabolism level. Such feed can also contribute to auxiliary benefits to animals such as weight gain. The base year considered for the study is 2014, and the forecast has been provided for the period between 2015 and 2020. Feed pigments are generally used to enhance the appearance and nutritive value of animal feed. Among all the feed pigments, carotenoids play the most important role and also dominate the feed pigments market. Animals are unable to synthesize carotenoids and rely on their diet for these compounds. Carotenoids have very high nutritional benefits and stimulate the production of white blood cells that help determine the overall immune status. They are known to act as antioxidants which can cure allergies, skin diseases, immune disorders, eye disorders, and to some extent any cardiovascular diseases present in the animals. There is an increasing awareness in the animal feed industry with regard to the health benefits of carotenoids for animals, thus driving the feed pigments market. During this research study, major players operating in the feed pigment market in various regions have been identified, and their offerings, regional presence, and distribution channels have been analyzed through in-depth discussions. Top-down and bottom-up approaches have been used to determine the overall market size. Sizes of the other individual markets have been estimated using the percentage splits obtained through secondary sources such as Hoovers, Bloomberg BusinessWeek, and Factiva, along with primary respondents. The entire procedure includes the study of the annual and financial reports of the top market players and extensive interviews with industry experts such as CEOs, VPs, directors, and marketing executives for key insights (both qualitative and quantitative) pertaining to the market. The figure below shows the breakdown of the primaries on the basis of the company type, designation, and region considered during the research study. The feed pigment market comprises a network of players involved in the research and product development; raw material supply; component manufacturing; distribution and sale; and post-sales services. 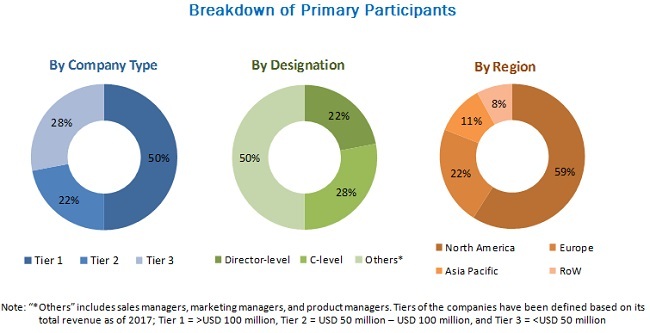 Key players considered in the analysis of the feed pigment market are BASF SE (Germany), Royal DSM NV (Netherlands), Kemin Industries, Inc. (US), Novus International, Inc. (US), Guangzhou Leader Bio-Technology Co., Ltd. (China), D.D. Williamson & Co., Inc. (DDW) (US), Nutrex NV (Belgium), Behn Meyer Group (Malaysia), Vitafor NV (Belgium), and Innovad AD NV/SA (Belgium). In November 2015, BASF SE (Germany) expanded its R&D capabilities in the Asia Pacific region by inaugurating the second phase of Innovation Campus the Asia Pacific in Shanghai (China). This expansion would help the company to develop new products focusing on new areas such as chemical processes and formulations. It will benefit the health and nutrition industry in terms of new products as well as revenue generation. In November 2015, Novus International, Inc., (US) acquired a methylmercaptopropanal (MMP) plant from Union Carbide Corporation (US), a subsidiary of The Dow Chemical Company (US). This acquisition would help the company to expand in the methionine market by promoting Alimet feed supplement in the US feed industry. In October 2015, DDW (US) opened a new manufacturing site in Louisville, US, for producing specialty colorings for prominent food & beverage companies in North America using innovative emulsion technology. The expansion would help the company to increase its revenue by supplying specialty colorings to the leading companies. In January 2015, Kemin Industries, Inc. (US) introduced new organic lutein, ORO GLO, for North American egg producers. This product would intensify the color of egg yolks and add lutein content. In January 2015, Behn Meyer Group (Malaysia) signed a partnership deed with AB Enzymes (Germany) for the distributorship of beverages, baking soda, and food & textile enzymes in Southeast Asia. It will help expand the business of the company in Southeast Asia and generate revenue. Associations and industry bodies such as Food and Agriculture Organization (FAO), EU Feed Additives and Pre-mixtures Association (FEFANA), European Feed Manufacturer’s Federation (FEFAC), The Compound Feed Manufacturers Association (CLMFA), Feed Ingredients & Additives Association of Australia (FIAAA), and International Feed Industry Federation (IFIF). What are new types in which the feed pigment manufacturers are exploring? The overall feed pigment market expected to grow from USD 917.4 million in 2015 to USD 1,071.4 million by 2020, at a CAGR of 3.2% from 2015 to 2020. The market growth is driven by growing customer demand for meat products and raising awareness about the health benefits of carotenoids for animals among the livestock growers. The market is further driven by factors such as growing industrialization of pork, aquaculture, and poultry business and acknowledgment of the importance of feed pigments in fish farming. Depending upon livestock, the global market is led by the poultry segment, followed by ruminants and swine. These are used on a large scale in regions where there is extensive demand for meat and meat products. The feed pigment market has been segmented, on the basis of type, into carotenoids, curcumin, caramel, spirulina, and others (riboflavin, betalains, and vegetable black). 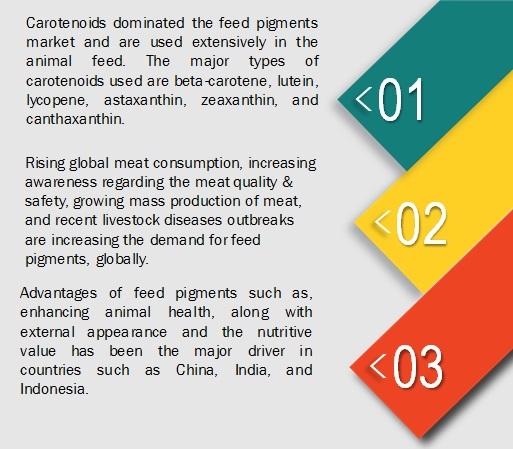 Among all feed pigment, carotenoids are majorly used in the feed industry. Carotenoids are added to the animal feed as nutrients, to support animal health and enhance the product quality. New forms or concentrated carotenoids are developed to help the feedstuff formulators to provide sufficient carotenoids to the animals at any given time; this contributes to the rapid growth of the market. Europe accounted for the largest market share in 2014 for feed pigments, followed by the Asia Pacific and North America. France and Germany constituted the largest country markets in the European region in 2014. Increasing awareness about the benefits of feed pigments is leading to the growth in this region. Also, adding feed pigments is an economical option which has led to increased sales of meat products in the European market. The Asia Pacific region is projected to be the fastest-growing market with investments from several multinational manufacturers, especially in countries such as China, India, and Japan. The demand for feed pigments is gaining more popularity as it improves the appearance of livestock and color of the meat and egg yolk produced. The consumption of feed pigments by the swine industry is more in the European and Asia Pacific regions as these regions are the top pork producers. Feed pigments improves the microbial balance and digestibility when included in swine feed, and thus strengthens the immune system. Feed pigments also increases the intake of nutritious feed by piglets, which promotes weight gain. Thus, the quantity and quality of meat is enhanced resulting in more profits to the breeders. With the increase in trade of pork and concerns over animal safety, the demand for feed pigments is projected to increase, so as to ensure good quality of pork/swine. Feed pigments provide poultry birds with enhanced nutrition, thereby increasing their growth rate. Feed pigments help in strengthening the immune system and also act as growth promoters; they help in adding nutritional value to feed. Ruminants are one of the most domesticated species throughout human history and can consume many by-products, which are not of much value for human consumption. Feeding ruminants with nutritious feed is very important, as they are a prime source of milk and meat. The increase in ruminant breeding increases the demand for feed pigments in the segment. Feed pigments increase the palatability of feed and also the energy intake by the animals. Performance of the ruminant is strongly dependent on the dosage and inclusion levels of pigments in their feed. Aquaculture is one of the fastest-growing cultures in the world's food production sector. Replicating the accurate natural color of fish is a challenge, and use of carotenoid pigments is effective in imparting wide spectrum of colors in fishes. Today, fish culture is suffering from serious losses due to various infectious diseases. The use of pesticides, antimicrobial drugs, and disinfectant for disease prevention in the aquaculture industry, growth promotion has led to the evolution of resistant strains of bacteria. Carotenoids are proven to be helpful in protection against damage caused by light and oxygen. They are responsible for the pigmentation of muscle in fish that are meant for consumption and skin in fish that are meant for fishkeeping. Presence of high levels of carotenoids makes fishes resistant to bacterial and fungal diseases. The quantity of pigment should be moderate; otherwise, it would deplete the level of oxygen, which is harmful to aquatic animals. Feed pigment, if supplemented in right quantities, would lead to the proper supply of essential nutrients. What are the upcoming types for feed pigments? The raw materials required for producing feed pigments are mainly extracted from natural sources such as seeds, roots, and plants. Depleting cultivable land and forest land has caused a negative impact on the growth of plants which are used as raw materials in feed pigments. Thus, there is a rise in the cost of extraction from these sources. The other factors such as a rise in the cost of materials, shifts in the manufacturing process, and innovations in the production process are restraining the growth of the feed pigment market. Key players in the market include BASF SE (Germany), Royal DSM NV (Netherlands), Kemin Industries, Inc. (US), Novus International, Inc. (US), Guangzhou Leader Bio-Technology Co., Ltd. (China), D.D. Williamson & Co., Inc. (DDW) (US), Nutrex NV (Belgium), Behn Meyer Group (Malaysia), Vitafor NV (Belgium), and Innovad AD NV/SA (Belgium). These players are increasingly undertaking expansions, acquisitions, new product launches, and partnerships & collaborations to develop and introduce new products in the market. 12.7 D.D. Williamson & Co., Inc. Figure 16 U.S.: Largest Market for Estimated to Be the Largest Market During the Forecast Period.